"Puppet show" redirects here. For other uses, see Puppet show (disambiguation). Puppetry is a very ancient art form, thought to have originated about 4000 years ago. Puppets have been used since the earliest times to animate and communicate the ideas and needs of human societies. Some historians claim that they pre-date actors in theatre. There is evidence that they were used in Egypt as early as 2000 BCE when string-operated figures of wood were manipulated to perform the action of kneading bread. Wire controlled, articulated puppets made of clay and ivory have also been found in Egyptian tombs. Hieroglyphs also describe "walking statues" being used in ancient Egyptian religious dramas. Puppetry was practiced in ancient Greece and the oldest written records of puppetry can be found in the works of Herodotus and Xenophon, dating from the 5th century BCE. Sub-Saharan Africa may have inherited some of the puppet traditions of ancient Egypt. Certainly, secret societies in many African ethnic groups still use puppets (and masks) in ritual dramas as well as in their healing and hunting ceremonies. Today, puppetry continues as a popular form, often within a ceremonial context, and as part of a wide range of folk forms including dance, storytelling, and masked performance. In the 2010s throughout rural Africa, puppetry still performs the function of transmitting cultural values and ideas that in large African cities is increasingly undertaken by formal education, books, cinema, and television. There is slight evidence for puppetry in the Indus Valley Civilization. Archaeologists have unearthed one terracotta doll with a detachable head capable of manipulation by a string dating to 2500 BC. Another figure is a terracotta monkey which could be manipulated up and down a stick, achieving minimum animation in both cases. The epic Mahabharata, Tamil literature from the Sangam Era, and various literary works dating from the late centuries BC to the early centuries AD, including Ashokan edicts, describe puppets. Works like the Natya Shastra and the Kamasutra elaborate on puppetry in some detail. The Javanese Wayang theater was influenced by Indian traditions. Some scholars trace the origin of puppets to India 4000 years ago, where the main character in Sanskrit plays was known as "Sutradhara", "the holder of strings". Wayang is a strong tradition of puppetry native of Indonesia, especially in Java & Bali. In Java, wayang kulit, an elaborate form of shadow puppetry is very popular. Javanese rod puppets have a long history and are used to tell fables from Javanese history. Another popular puppetry form in Indonesia is Wayang golek. China has a history of puppetry dating back 3000 years, originally in "pi-yung xi", the "theatre of the lantern shadows", or, as it is more commonly known today, Chinese shadow theatre. By the Song Dynasty (960–1279 AD), puppets played to all social classes including the courts, yet puppeteers, as in Europe, were considered to be from a lower social stratum. In Taiwan, budaixi puppet shows, somewhat similar to the Japanese Bunraku, occur with puppeteers working in the background or underground. Some very experienced puppeteers can manipulate their puppets to perform various stunts, for example, somersaults in the air. Japan has many forms of puppetry, including the bunraku. Bunraku developed out of Shinto temple rites and gradually became a highly sophisticated form of puppetry. Chikamatsu Monzaemon, considered by many to be Japan's greatest playwright, gave up writing Kabuki plays and focused exclusively on the puppet-only Bunraku plays. Initially consisting of one puppeteer, by 1730 three puppeteers were used to operate each puppet in full view of the audience. The puppeteers, who dressed all in black, would become invisible when standing against a black background, while the torches illuminated only the carved, painted and costumed wooden puppets. In Korea, the tradition of puppetry is thought to have come from China. The oldest historical evidence of puppetry in Korea comes from a letter written in 982 A.D. from Choe Seung-roe to the King. In Korean, the word for puppet is "Kkoktugakshi". "Gagsi" means a "bride" or a "young woman", which was the most common form the dolls took. A kkoktugakshi puppet play has eight scenes. 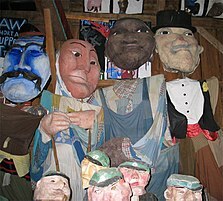 Thailand has Hun Krabok, a rod puppet theatre which is the most popular form of puppetry. Vietnam developed the art form of water puppetry, that is unique to that country. The puppets are built out of wood and the shows are performed in a waist high pool. A large rod under the water is used by the puppeteers to support and control the puppets. The appearance is created of the puppets moving over water. The origin of this form of puppetry dates back seven hundred years when the rice fields would flood and the villagers would entertain each other, eventually resulting in puppet show competitions between villages. This led to puppet societies becoming secretive and exclusive. India has a long tradition of puppetry. In the ancient Indian epic Mahabharata there are references to puppets. 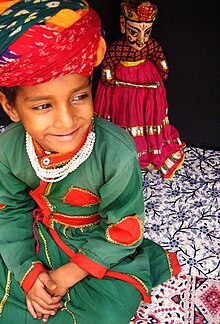 The Rajasthani Puppet from India is notable and there are many Indian ventriloquists and puppeteers. The first Indian ventriloquist, Professor Y.K. Padhye, introduced this form of puppetry to India in the 1920s and his son, Ramdas Padhye, subsequently popularised ventriloquism and puppetry. Almost all types of puppets are found in India. India has a rich and ancient tradition of string puppets or marionettes. Marionettes having jointed limbs controlled by strings allow far greater flexibility and are, therefore, the most articulate of the puppets. Rajasthan, Orissa, Karnataka and Tamil Nadu are some of the regions where this form of puppetry has flourished. The traditional marionettes of Rajasthan are known as Kathputli. Carved from a single piece of wood, these puppets are like large dolls that are colourfully dressed. The string puppets of Orissa are known as Kundhei. The string puppets of Karnataka are called Gombeyatta. Puppets from Tamil Nadu, known as Bommalattam combine the techniques of both rod and string puppets. India has a variety of types and styles of shadow puppets. Shadow puppets are flat figures cut out of leather, which has been treated to make it translucent. Shadow puppets are pressed against the screen with a strong source of light behind it. The manipulation between the light and the screen make silhouettes or colourful shadows, as the case may be, for the viewers who sit in front of the screen. This tradition of shadow puppets survives in Orissa. Kerala, Andhra Pradesh, Karnataka, Maharashtra and Tamil Nadu. Tholpavakoothu (or Tolpava Koothu) is a tradition of shadow puppetry that is unique to Kerala, India. The shadow theatre of Karnataka is known as Togalu Gombeyatta. These puppets are mostly small in size. The puppets however differ in size according to their social status, for instance, large size for kings and religious characters and smaller size for common people or servants. Rod puppets are an extension of glove-puppets, but often much larger and supported and manipulated by rods from below. This form of puppetry now is found mostly in West Bengal and Orissa. The traditional rod puppet form of West Bengal is known as Putul Nautch. They are carved from wood and follow the various artistic styles of a particular region. The traditional rod puppet of Bihar is known as Yampuri. Glove puppets, are also known as sleeve, hand or palm puppets. The head is made of either papier mache, cloth or wood, with two hands emerging from just below the neck. The rest of the figure consists of a long flowing skirt. These puppets are like limp dolls, but in the hands of an able puppeteer, are capable of producing a wide range of movements. The manipulation technique is simple the movements are controlled by the human hand the first finger inserted in the head and the middle finger and the thumb are the two arms of the puppet. With the help of these three fingers, the glove puppet comes alive. The tradition of glove puppets in India is popular in Uttar Pradesh, Orissa, West Bengal and Kerala. In Uttar Pradesh, glove puppet plays usually present social themes, whereas in Orissa such plays are based on stories of Radha and Krishna. In Orissa, the puppeteer plays on the dholakwith one hand and manipulates the puppet with the other. The delivery of the dialogues, the movement of the puppet and the beat of the dholak are well synchronised and create a dramatic atmosphere. In Kerala, the traditional glove puppet play is called Pavakoothu. Afghanistan has produced a form of puppetry known as buz-baz. During a performance a puppeteer will simultaneously operate a marionette of a markhor while playing a dambura. Middle Eastern puppetry, like its other theatre forms, is influenced by the Islamic culture. Karagoz, the Turkish Shadow Theatre, has widely influenced puppetry in the region and it is thought to have passed from China by way of India. Later, it was taken by the Mongols from the Chinese and passed to the Turkish peoples of Central Asia. The art of Shadow Theater was brought to Anatolia by the Turkish people emigrating from Central Asia. Other scholars claim that shadow theater came to Anatolia in the 16th century from Egypt. The advocates of this view claim that shadow theatre found its way into the Ottoman palaces when Yavuz Sultan Selim conquered Egypt in 1517. He saw shadow theatre performed during a party in his honour and he was said to be so impressed with it that he took the puppeteer back to his palace in Istanbul where his 21-year -old son, later Sultan Suleyman the Magnificent, developed an interest in the plays. In other areas, the style of shadow puppetry known as khayal al-zill, a metaphor translated as "shadows of the imagination" or "shadow of fancy", still survives. This is a shadow play with live music, "the accompaniment of drums, tambourines and flutes...also..."special effects" – smoke, fire, thunder, rattles, squeaks, thumps, and whatever else might elicit a laugh or a shudder from his audience"
In Iran, puppets are known to have existed much earlier than 1000 AD, but initially only glove and string puppets were popular . Other genres of puppetry emerged during the Qajar era (18th and 19th centuries) as influences from Turkey spread to the region. Kheimeh Shab-Bazi is a traditional Persian puppet show which is performed in a small chamber by a musical performer and a storyteller called a morshed or naghal. These shows often take place alongside storytelling in traditional tea and coffee-houses (Ghahve-Khane). The dialogue takes place between the morshed and the puppets. A recent example of puppetry in Iran is the touring opera Rostam and Sohrab. Although there are few remaining examples of puppets from ancient Greece, historical literature and archaeological findings shows the existence of puppetry. The Greek word translated as "puppet" is "νευρόσπαστος" (nevrospastos), which literally means "drawn by strings, string-pulling", from "νεῦρον" (nevron), meaning either "sinew, tendon, muscle, string", or "wire", and "σπάω" (spaō), meaning "draw, pull". Aristotle referred to pulling strings to control heads, hands and eyes, shoulders and legs. Plato's work also contains references to puppetry. The Iliad and the Odyssey were presented using puppetry. The roots of European puppetry probably extend back to the Greek plays with puppets played to the "common people" in the 5th century BC. By the 3rd century BC these plays would appear in the Theatre of Dionysus at the Acropolis. 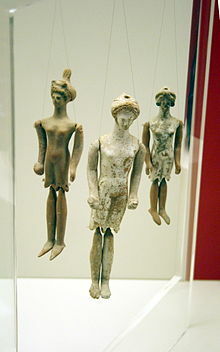 In ancient Greece and ancient Rome clay dolls, and a few of ivory, dated from around 500 BC, were found in children's tombs. These dolls had articulated arms and legs, and in some cases an iron rod extending up from the tops of their heads. This rod was used to manipulate the doll from above, as it is done today in Sicilian puppetry. A few of these dolls had strings in place of rods. Some researchers believe these ancient figures were simply toys and not puppets, due to their small size. Italy is considered by many to be the early home of the marionette due to the influence of Roman puppetry. Xenophon and Plutarch refer to them. The Christian church used marionettes to perform morality plays. It is believed that the word marionette originates from the little figures of the Virgin Mary, hence the word "marionette" or "Mary doll. Comedy was introduced to the plays as time went by, and ultimately led to a church edict banning puppetry. Puppeteers responded by setting up stages outside cathedrals and became even more ribald and slapstick. Out of this grew the Italian comedy called Commedia dell'arte. Puppets were used at times in this form of theatre and sometimes Shakespeare's plays were performed using marionettes instead of actors. In Sicily, the sides of donkey carts are decorated with intricate, painted scenes from the Frankish romantic poems, such as The Song of Roland. These same tales are enacted in traditional puppet theatres featuring hand-made marionettes of wood. In Sicilian this is called "Opera dei pupi", or "Opera of the puppets". The "Opera dei pupi" and the Sicilian tradition of cantastorie, the word for storyteller, are rooted in the Provençal troubadour tradition, in Sicily during the reign of Frederick II, Holy Roman Emperor, in the first half of the 13th century. The 18th century was a vital period in the development of all Italian theatre, including the marionette theatre. The rod puppet was mainly of lower-class origin, but the marionette theatre was popular in aristocratic circles, as a celebration of the Age of Enlightenment. The effects, and the artful and complex construction of the puppets, the puppet theatres, and the puppet narratives, were all popular, particularly in Venice. In the 19th century, the marionettes of Pietro Radillo became more complex and instead of just the rod and two strings, Radillo's marionettes were controlled by as many as eight strings, which increased control over the individual body parts of the marionettes. 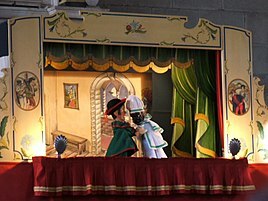 Guignol is the main character in the French puppet show which has come to bear his name. Although often thought of as children's entertainment, Guignol's sharp wit and linguistic verve have always been appreciated by adults as well, as shown by the motto of a prominent Lyon troupe: "Guignol amuses children… and witty adults". Laurent Mourguet, Guignol's creator, fell on hard times during the French Revolution, and in 1797 started to practice dentistry, which in those days was simply the pulling of teeth. To attract patients, he started setting up a puppet show in front of his dentist's chair. His first shows featured Polichinelle, a character borrowed from the Italian commedia dell'arte. By 1804 the success was such that he gave up dentistry altogether and became a professional puppeteer, creating his own scenarios drawing on the concerns of his working-class audience and improvising references to the news of the day. He developed characters closer to the daily lives of his Lyon audience, first Gnafron, a wine-loving cobbler, and in 1808 Guignol. Other characters, including Guignol's wife Madelon and the gendarme Flagéolet soon followed, but these are never much more than foils for the two heroes. Guignol's inevitable victory is always the triumph of good over evil. The traditional British Punch and Judy puppetry traces its roots to the 16th century to the Italian commedia dell'arte. The character of "Punch" derives from the character Pulcinella, which was Anglicized to Punchinello. He is a manifestation of the Lord of Misrule and Trickster, figures of deep-rooted mythologies. Punch's wife was originally "Joan", but later became "Judy". 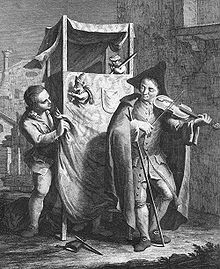 In the late 18th and early 19th centuries, the familiar Punch and Judy puppet show which existed in Britain was performed in an easily transportable booth. The British Puppet and Model Theatre Guild in the early 20th century instigated a resurgence of puppetry. Two of the Guild's founders, H. W. Whanslaw and Waldo Lanchester, both worked to promote and develop puppetry with publications of books and literature, mainly focusing on the art of the marionette. Lanchester had a touring theatre and a permanent venue in Malvern, Worcestershire, regularly taking part in the Malvern Festival and attracting the attention of George Bernard Shaw. One of Shaw's last plays, Shakes versus Shav, was written for and first performed in 1949 by the company. From 1957 to 1969, Gerry Anderson produced many television series starring marionettes, starting with Roberta Leigh's The Adventures of Twizzle and ending with The Secret Service. Many of these series (the most famous of which was Thunderbirds) employed a technique called Supermarionation, which automatically synchronized the pre-recorded character dialogue to the puppets' mouth movements. Anderson returned to puppetry in 1983 with Terrahawks and the unaired pilot Space Police in 1987. Current British puppetry theatres include the Little Angel Theatre in Islington, London, Puppet Theatre Barge in London, Norwich Puppet Theatre, the Harlequin Puppet Theatre, Rhos-on-Sea, Wales, and the Biggar Puppet Theatre, Biggar, Lanarkshire, Scotland. British puppetry now covers a wide range of styles and approaches. Don Austen, a British puppeteer, worked with Jim Henson's Creature Shop, and also worked on a number of feature films. There are also a number of British theatre companies, including Horse and Bamboo Theatre, and Green Ginger, which integrate puppetry into highly visual productions. From 1984 to 1996, puppetry was used as a vehicle for political satire in the British television series Spitting Image. Puppetry has also been influencing mainstream theatre, and several recent productions combine puppetry with live action, including Warhorse, at the Royal National Theatre and Madam Butterfly at the English National Opera. Many regional variants of Pulcinella were developed as the character spread across Europe. In the Netherlands it is Jan Klaassen (and Judy is Katrijn); in Denmark Mester Jackel; in Russia Petrushka; and in Romania Vasilache. In Russia, the Central Puppet Theatre in Moscow and its branches in every part of the country enhanced the reputation of the puppeteer and puppetry in general. There is a long tradition of puppetry in Germany and Austria. Much of it derives from the 16th-century tradition of the Italian commedia dell'arte. The German version of the British character of 'Punch' is called Kasperle of Kaspar while Judy is called Grete. In the 18th century, operas were specifically composed for marionette puppets. Gluck, Haydn, de Falla and Respighi all composed adult operas for marionettes. In 1855, Count Franz Pocci founded the Munich Marionette Theatre. A German dramatist, poet, painter and composer, Pocci wrote 40 puppet plays for his theatre. Albrecht Roser has made a considerable impact with his marionettes in Stuttgart. His characters Clown Gustaf and Grandmother are well-known. Grandmother, while outwardly charming, is savagely humorous in her observations about all aspects of society and the absurdities of life. In Lindau, the Lindau Marionette Opera was founded in 2000 by Bernard Leismueller and Ralf Hechelmann. The company performs a large number of operas as well as a marionette ballet, Swan Lake. In Augsburg, the historic Augsburg Marionette Theatre was founded in 1943 by Walter Oehmichen. It continues to this day along with an adjoining puppet museum under the grandsons of the founder, Klaus Marschall and Juergen Marschall. Much earlier in nearby Salzburg, Austria, the Salzburg Marionette Theatre was founded in 1913 by Professor Anton Aicher and is world-famous. The Salzburg Marionette Theatre still continues the tradition of presenting full-length opera using marionettes in their own purpose built theatre until recently under the direction of Gretl Aicher. It performs mainly operas such as Die Fledermaus and The Magic Flute and a small number of ballets such as The Nutcracker. The Salzburg Marionette Theatre productions are aimed for adults although children are of course welcome. There is also a marionette theatre at Schoenbrunn Palace in Vienna. Marionette puppet theatre has had a very long history in entertainment in Prague, and elsewhere in the Czech Republic. It can be traced deep into the early part of the Middle Ages. Marionettes first appeared around the time of the Thirty Years' War. The first noted Czech puppeteer was Jan Jiri Brat, who was born in 1724. He was the son of a local carpenter and created his own puppet theatre. Matej Kopecky was the most famous 19th-century Czech puppeteer, and was responsible for communicating the ideas of national awareness. In 1920 and 1926 respectively, Josef Skupa created his most famous puppet characters: comical father Spejbl and his rascal son Hurvínek. In 1930, he set up the first modern professional puppet theatre. An important puppet organisation is the National Marionette Theatre in Prague. Its repertoire mainly features a marionette production of Mozart's opera Don Giovanni. The production has period costumes and 18th-century setting. There are numerous other companies, including Buchty a Loutky ("Cakes and Puppets"), founded by Marek Bečka. Puppets have been used extensively in animated films since 1946. Jiří Trnka was an acknowledged leader in this area. Miroslav Trejtnar is a master puppeteer and teacher of traditional Czech marionette-making skills. Throughout this period, puppetry developed separately from the emerging mainstream of actor theatres, and the 'ragged' puppeteers performed outside of theatre buildings at fairs, markets etc., continuing to be classified along with bandits and gypsies. In the 19th century, puppetry faced competition from other forms of theatre such as vaudeville and music hall, but it adapted to these challenges, for example: by developing stage acts and participating in the new forms of popular theatre, or reinventing itself in other ways and finding audiences at the newly fashionable seaside resorts. The Teotihuacan culture (Central Mexico) of 600 AD made figurines with moveable arms and legs as part of their funerary rites. Native Americans also used ceremonial puppets. In 1519, two puppeteers accompanied Hernando Cortez on his first journey to Mexico. Europeans brought their own puppet traditions with them, but gradually distinctive styles, forms and puppet characters developed in North America. During the Depression, folk puppeteers traveled with carnivals, working with their own scripts and with dioramas and marionettes of their own manufacture. Some advances in 20th-century puppetry have originated in the United States. Marionette puppetry was combined with television as early as the 1940s, with Howdy Doody of the United States being a notable marionette in this field. Bil Baird worked on revitalising marionette theatre and puppetry in the United States. He and his wife, Cora Eisenberg had their own marionette theatre in New York. Ventriloquist, Edgar Bergen also made a major contribution. In the 1960s Peter Schumann's Bread and Puppet Theater developed the political and artistic possibilities of puppet theatre in a distinctive, powerful and immediately recognizable way. At roughly the same time, Jim Henson was creating a type of soft, foam-rubber and cloth puppet which became known collectively as Muppets. Initially, through the children's television show Sesame Street, and later in The Muppet Show and on film, these inspired many imitators and are today are recognised almost everywhere. Wayland Flowers also made a major contribution to adult puppetry with his satirical puppet, Madame. Puppets also have been used in the Star Wars films, notably with the character of Yoda. His voice and manipulation was provided by Frank Oz. Leslie Madeline Fleming and Bleeckie, a character from a series of web videos. The Aboriginal peoples of Australia have a long tradition of oral storytelling which goes back many thousands of years. They used masks and other objects to convey deep and meaningful themes about morality and nature. Masks were carved from wood and heavily decorated with paint and feathers. In Australia in the 1960s, Peter Scriven founded the Marionette Theatre of Australia and had beautiful marionette productions such as The Tintookies, Little Fella Bindi, The Explorers and The Water Babies. Philip Edmiston, who worked alongside Peter Scriven at the Marionette Theatre of Australia, went on to mount in 1977 a lavish marionette production of The Grand Adventure under the umbrella of his own company, Theatrestrings. With 127 marionettes, the A$120,000 production opened in Nambour in the Civic Hall on 28 May 1977 and subsequently toured to Sydney, Melbourne and Brisbane. The musical had music by Eric Gross and book and lyrics by Hal Saunders. The story broadly told of Captain James Cook's South Sea Island voyage with botanist Joseph Banks on HMS Endeavour. Edmiston went on to tour Queensland throughout the 1980s and 1990s with numerous productions with his new company Queensland Marionette Theatre. Bilbar Puppet Theatre, established by Barbara Turnbull and her husband Bill Turnbull, toured Australia extensively under the auspices of the Queensland Arts Council in the 1970s and 1980s. Their shows included The Lucky Charm, Funnybone, Mozart's opera Bastien and Bastienne, and Lazy Liza. Bilbar Puppet Theatre's puppets are now held at the Queensland Performing Arts Centre, Brisbane. David Poulton toured marionette shows via the Queensland Arts Council along his 'Strings and Things' with his wife Sally for many years from the late 1970s. David Hamilton, one of the last remaining marionette puppeteers in Australia, tours independently and formerly toured under the auspices of the Queensland Arts Council. Some of his puppets were displayed in a special puppet exhibition mounted at the Queensland Performing Arts Complex in 2018. Comedian and radio broadcaster Jamie Dunn was famous for his Muppet-style character, Agro, who featured on several Seven Network television programs throughout the 1980s and 1990s. Formally trained in the United States by puppeteers from the Jim Henson Company, Brett Hansen and his Brisbane-based Larrikin Puppets company is one of only a few Muppet-style puppeteers actively performing in Australia. Cabaret Puppet Theatre, based in Brisbane's Redlands area, also tours with productions for children and adults. In Melbourne, Handspan Theatre (1977-2002) evolved from humble collective beginnings to evolve a design-rich large theatre format dubbed 'Visual Theatre' and became a hothouse for innovative projects and award-winning multimedia collaborations within Australia and around the world. A post-graduate course existed at the Victorian College of the Arts, University of Melbourne in the late 1990s. Australian puppeteer Norman Hetherington was famous for his marionette, Mr. Squiggle, who featured on an Australian Broadcasting Commission television program from 1 July 1959 until 9 July 1999. In every episode he would create several pictures from "squiggles" sent in by children from around the country. Richard Bradshaw OAM is another famous Australian puppeteer. He is a past president of UNIMA Australia, former artistic director of the Marionette Theatre Company of Australia, and does shadow puppetry and writing in the field. Rod Hull also made a contribution with his puppet Emu. In the 1960s, Hull presented a children's breakfast television programme in Australia. Snuff Puppets is one of Australia's modern puppet theatre troupes. Based in Melbourne, their work is full of wild black humour, political and sexual satire, and a handmade aesthetic. Snuff Puppets has performed in over 15 countries, including tours to major festivals in Asia, South America and Europe. There is an annual winter festival of puppets at the City of Melbourne's ArtPlay and at Federation Square in Melbourne. In Sydney, Jeral Puppets, founded by John and Jackie Lewis in 1966, regularly performs at Puppeteria Puppet Theatre and on tour. From early in the 19th century, puppetry began to inspire artists from the 'high-art' traditions. In 1810, Heinrich von Kleist wrote an essay 'On the Marionette Theatre', admiring the "lack of self-consciousness" of the puppet. Puppetry developed throughout the 20th century in a variety of ways. Supported by the parallel development of cinema, television and other filmed media it now reaches a larger audience than ever. 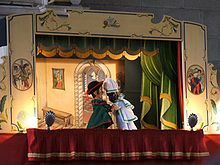 Another development, starting at the beginning of the century, was the belief that puppet theatre, despite its popular and folk roots, could speak to adult audiences with an adult, and experimental voice, and reinvigorate the high art tradition of actors' theatre. Sergei Obraztsov explored the concept of kukolnost ('puppetness'), despite Joseph Stalin's insistence on realism. Other pioneers, including Edward Gordon Craig and Erwin Piscator were influenced by puppetry in their crusade to regalvanise the mainstream. Maeterlinck, Shaw, Lorca and others wrote puppet plays, and artists such as Picasso, Jarry, and Léger began to work in theatre. Craig's concept of the "übermarionette"—in which the director treats the actors like objects—has been highly influential on contemporary "object theatre" and "physical theatre". Tadeusz Kantor frequently substituted actors for puppets, or combined the two, and conducted each performance from the edge of the stage, in some ways similar to a puppeteer. Kantor influenced a new formalist generation of directors such as Richard Foreman and Robert Wilson who were concerned with the 'object' in theatrical terms "putting it on stage and finding different ways of looking at it" (Foreman). Innovatory puppeteers such as Tony Sarg, Waldo Lanchester, John Wright, Bil Baird, Joan Baixas, Sergei Obratsov, Philipe Genty, Peter Schumann, Dattatreya Aralikatte, Jim Henson, Dadi Pudumjee, and Julie Taymor have also continued to develop the forms and content of puppetry, so that the phrase 'puppet theatre' is no longer limited to traditional forms of marionettes, glove, or rod puppets. Directors and companies like Peter Schumann of Bread and Puppet Theatre, Bob Frith of Horse and Bamboo Theatre, and Sandy Speiler of In the Heart of the Beast Puppet and Mask Theatre have also combined mask and puppet theatre where the performer, puppets and objects are integrated within a largely visual theatre world that minimises the use of spoken language. The Jim Henson Foundation, founded by puppeteer and Muppet creator Jim Henson, is a philanthropic, charitable organization created to promote and develop puppetry in the United States. It has bestowed 440 grants to innovative puppet theatre artists. [better source needed] Puppetry troupes in the early 21st-century such as HomeGrown Theatre in Boise, Idaho continue the avant garde satirical tradition for millennials. ^ a b Dugan, E.A., Emotions in Motion. ^ a b c Sang-su, Choe. "A Study of the Korean Puppet Play". p. 43. ^ "Centre for Cultural Resources and Training (CCRT)". ccrtindia.gov.in. Retrieved 2018-01-03. ^ Feeney, John, Saudi Aramco World (article), 1999. ^ Mehr News Agency, www.mehrnews.com, 7 July 2007. ^ Iran Daily www.iran-daily.com, 1 March 2006. ^ Beaton, Mabel & Les, Marionettes: A Hobby for Everyone. ^ Signorelli, Collezione Maria, www.collezionemariasignorelli.it. ^ Berry, Harrison (2017-12-12). "Horrific Puppet Affair Finds Humor in the Space Between Halloween and Christmas". Boise Weekly. Retrieved 2017-12-12. ^ Burton, Brooke (2017-12-20). "Puppetry, Pantomime, & Projections: HomeGrown Theatre's Shortcut to Spectacle". Boise City Department of Arts & History. Retrieved 2017-12-20. Lindsay, Hilarie (1976). The First Puppet Book. Leichhardt, NSW, Australia: Ansay Pty Ltd. ISBN 0909245061. Vella, Maeve; Helen Rickards (1989). Theatre of the Impossible: puppet theatre in Australia. Roseville, N.S.W: Craftsman's House. ISBN 0-947131-21-3. "Wayland Flowers Dies: Ventriloquist Was 48". The New York Times. October 12, 1988. Retrieved 2006-12-30. Wikimedia Commons has media related to Puppetry. The Center for Puppetry Arts - Puppetry Museum and Theater in Atlanta, GA, US. The Puppetry Homepage - Contains links and information about all types of puppets and puppetry. Puppet Notebook- Articles on puppet history, theory and contemporary international puppetry in magazine published by British UNIMA.